When you and your spouse have milestone birthdays and an anniversary in the same year… it is time to celebrate BIG TIME. While most folks would think the best way to do this is a fabulous cruise in the Caribbean or a luxury hotel stay in Paris, my husband and I tend to think “outside the box”. 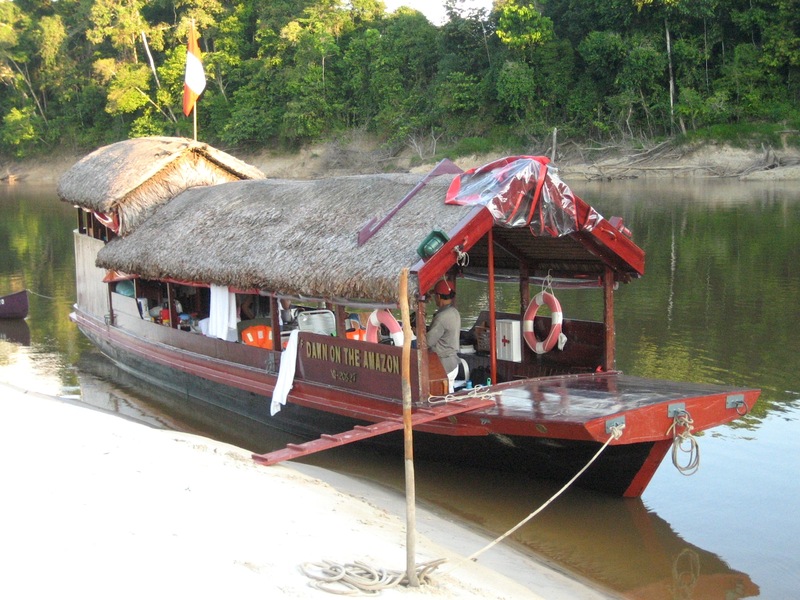 So for our big celebrations that particular year we chose to cruise up the Peruvian part of the Amazon during the dry season on a wooden riverboat named Dawn on the Amazon. You see, we were keen to explore the Allpahuayo Mishana National Reserve. We believed our cultural adventure would only begin once we were actually in the Amazon. Au contraire! We began our journey with a 7 hour flight to Lima from Houston. “Not too bad” we thought as travelers who had commuted between Southeast Asia and the Midwestern US for more than a decade and a half. We then spent the night on the marble floor of the airport trying to sleep and hoping that the 2 hour flight to Iquitos we booked would actually be a real flight and not some figment of our collective imagination. Why be worried you may ask? Because Iquitos is the world’s largest city that cannot be reached by any road. You can only get there by airplane or boat. And then there were the three wheel rickshaws (moto-kars) that managed miraculously to get us from the airport to the city on narrow roads in one piece. Once in the city center, we met up with our guide Bill Grimes, who is from Indiana. (Background information: I married into another Hoosier family that knew him so it was all good.) We got settled into our temporary apartment accommodations and set out to check out Iquitos. The city has many elegant mansions and the Iron House that was designed by Gustave Eiffel-yes the famous Eiffel who built the tower in Paris. All of these were erected courtesy of the rubber boom that fueled the economy in the 19th century. Another major attraction is the Belen market where you can buy almost anything: clothing, crafts, fish, fruits, meat, medicinal herbs, toys, vegetables, and many unknown items. I managed to make it through this open air market without incident until I hit the fish and meat section…I have a weak stomach you see. The smell of fish and meat in the hot and humid conditions nearly sent me over the edge. I quickly found fresh air in the flower and fruit section of the market while the rest of my party continued to examine the other goods. Once we were familiar with Iquitos it was time to cruise the Amazon. Because it was the dry season, we watched the 20-25 foot high riverbanks fall into the water (think glaciers calving). We were also able to see many tropical birds, including the well-known toucan. We “fished” for piranhas and peacock bass in the small ponds that were left behind in the rainforest by the receding Amazon flood waters. I say “fish” because I never caught a single thing except my husband’s hat. I even got up close and personal with a three-toed sloth. Their hair feels like the sticky part of a post-it note because of the green algae that grows on it. While on the river in the reserve, we also stopped at a local village to meet the village elders and tour their one room school. We had brought school supplies with us in our backpacks for the local children and I thought I was meeting the teacher for the tour after meeting the elders. What I thought would be a simple affair turned into quite a production when they found out that I was a “profesora”. A village gathering was quickly called that included an elaborate ceremony where I handed out school supplies to each of the elders so that they could be distributed to the students equitably. Only then was I able to go on my school tour. In the end, it was a once in a lifetime trip. The Amazonian rainforests have amazing flora and fauna. More remarkable are the people who live there. They are gracious and resilient in very trying environmental conditions. I’d like to go back for the next big milestone birthdays and anniversary in our lives…but do it during the rainy season so as to experience another side of the amazing Amazon. Quite an experience! You would enjoy the book It’s a Jungle Out There! by Ron Snell. This is a retailing an MK’s life growing up on the Amazon River. There is a sequel to that also.